Home » Posts tagged "coldwar"
The House of Terror, 60 Andrássy Street, Budapest, land of useless victimized nationalism: Hungary. A Giant House, framed in black steel, effective and shocking way to show a museums location. To bad it’s a bloody mess. The museum has a vast amount of plaques with quotes, from famous Hungarians, on Hungarian! Hungarian, a language of the Ugric group, spoken only by the some 15 million Hungarians worldwide, and only comprehensible by the fellows in Finland and Estonia, and by fellows, I mean fellow incomprehensible languages. There’s virtually no translations of any of the plaques, only a few ragtag subtitles on a few running movies, and the history texts scattered around the places. The entire house is designed as a giant symbol of the secret Hungarian government apparatus, both the fascist 1944-45 and communist governments. The problem is, that this symbolism, drowns out the facts. 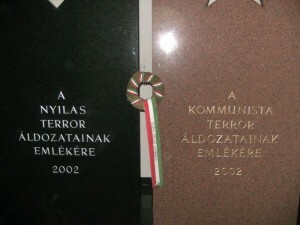 Combined, all these elements ensures the museums part failure, at educating its visitors in the horrors of the dictatorial governments, that dominated Hungary from 1944 to 1989. It also fails completely, at mentioning the simple glowing fact, that Hungary wasn’t the only country this happened to, every single eastern European country, suffered from secret police and government terror. The artistic value of the museum is well-worth mentioning, but the artistic value is ill-placed, considering this is suppose to be a museum of absolutely awful government sanctioned actions. We don’t need all the symbols, we just need the truth, dictatorial governments are bad, democracy is good. Not some pop-culture party, of annoying music, retarded symbols and pointless design. A failure, drowned in the sea of Hungarian selfishness and vanished in symbolic obscurity.